Read this blog to get acquainted with the common mistakes to avoid while investing in mutual funds in 2019. Mistakes are an inevitable part of human life. They are proof that a person is trying on something. If we go with the definition, it too states that mistakes are something that doesn’t work out in search of a solution. So, is it okay to make a mistake and learn, always? Well, no! There are a few of them which one can completely avoid by learning from the experience of others. Managing financial losses is one such mistake. To prevent losses that mutual fund investors make in common, go through the write-up to the end and learn about them in detail. If you are someone who has already committed a few of them listed here, then don’t worry as you will also find ways to reduce the losses. So without any ado, let’s begin! One of the cardinal mistakes that people commit during mutual fund investment is choosing just the equity funds. It should be remembered that mutual funds are not just about the equity category schemes. To make the best of this investment avenue, one must choose from the broad categories and explore the best of debt funds, balanced funds, liquid funds, gold funds, etc., suiting different needs. For instance, a long-term goal can be best handled by investing in small-cap schemes or diversified equity mutual funds. Similarly, a medium-term goal is best treated by a debt fund or balanced scheme. To create an emergency fund, liquid funds are the best option available. It’s always the percentage of returns that a scheme has delivered which entice the investors to stow money in that particular scheme. Most of us are obsessed with the idea of scheme’s returns outstanding its benchmark and peers over a period. However, one must remember the prominent disclaimer which says, ‘past returns are not indicative of future performance. Other crucial parameters should be looked upon such as the risk parameters, expense ratio, portfolio allocation, investment strategy, etc. Because when investing in a market-linked instrument, at the end of the day one can control the risk and not the returns. Losing patience in the way forces one to take short-term decisions which are indeed meant to hamper one’s long term goals. In the mutual fund world, it is the time that works in favor and not the timing. One must maintain discipline and be determined about reaching the set goal. Keeping patience through the different market cycles is what can award one with outstanding returns. If you are not confident about taking a risk with a more substantial amount, prefer SIP investment which helps investors develop a habit of disciplined investment and provides the benefit of compounding and rupee cost averaging. The experts associated with us perform in-depth analysis to catch on the upcoming market trends so that our investors can make the most from the opportunities available in time. Still, there are a few of investors who don’t prefer coming out of their shell and invest in a set pattern. This way they end up making average returns. If you too follow a DIY investment approach, and in an urge to save a few bucks, you are losing out on valuable guidance, then it’s time you wake up. Make the most of the market opportunities by embarrassing both market dip and rise. Invest in SIP and accumulate more returns when the market is high with a spike in fund’s NAV and more units when the market is down at lower NAV. Further, read about the latest trends and invest accordingly. For instance, it was said earlier at the beginning of the year that debt funds will do well in 2019, so link a goal with one such scheme and make the most from the opportunity. Diversification in mutual funds is all about risk reduction. Whether you invest via SIP or lump sum, diversification helps you to spread your money in more asset classes, thus preventing your portfolio returns to be vulnerable to one particular theme. Again, there are people who take diversification too seriously and often end up going beyond a point. This is something which should be done intelligently. On adding same kinds of assets in the portfolio, you are doing risk substitution and not reduction. In that case, taking help from an industry expert and regular portfolio checkup is the only way out. One of the most crucial mistakes that investors often make is investing in a matter that is not aligned with their goals. Above all, it’s just a goal which you are chasing or moving towards through investment either for a short-term or long-term. This is where the birth of other investment errors took place. To avoid it, just remember the four-step process to investing in mutual funds, i.e., select the objective you wish to accomplish, set a tenure, select the amount and investment avenue, check your risk appetite with the scheme, and invest. Besides, it’s always better to get customized advice from experts. They can surely add a little more value beyond what robots can do. In that case, we, at MySIPonline, are always available at your service. Connect with us if you are looking for a customized portfolio to invest in. 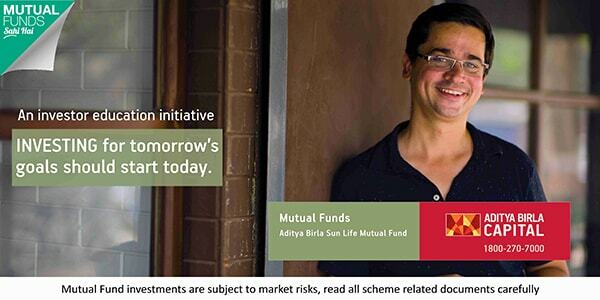 Have a question regarding a regular fund scheme, submit it below in the link provided to ask an expert!